These Mediterranean Chicken Breasts look (and taste) fancy, but you can make it start to finish in 30 minutes! Creamy goat cheese, salty sun dried tomatoes and marinated artichoke hearts, and garlicky spinach all combine in this amazing dinner! While the chicken is cooking, prepare the sauce ingredients–measure out the chicken broth + vinegar or the wine, slice the lemons in half, mince the garlic, and measure the butter. If you still have time, prepare the toppings–have the spinach ready to go, chop the sun dried tomatoes and artichokes, and crumble the cheese. Set aside. When the chicken breasts are done cooking, remove from heat and lower the heat to medium-low. Add the chicken broth mixture or wine to the pan and scrape the browned bits off the bottom of the pan into the liquid. Add the garlic, butter, and squeeze the lemons into the pan. 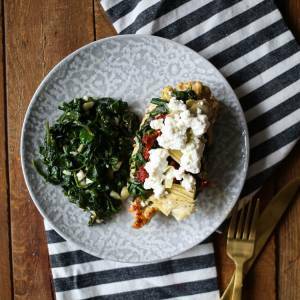 Return the chicken breasts to the pan and top with the spinach, sun dried tomatoes, artichoke hearts, and goat cheese. Cover the pan and heat until the spinach is heated through and the cheese is soft and warm. Transfer the chicken breasts to serving plates and spoon the sauce from the pan over the chicken. Serve immediately.